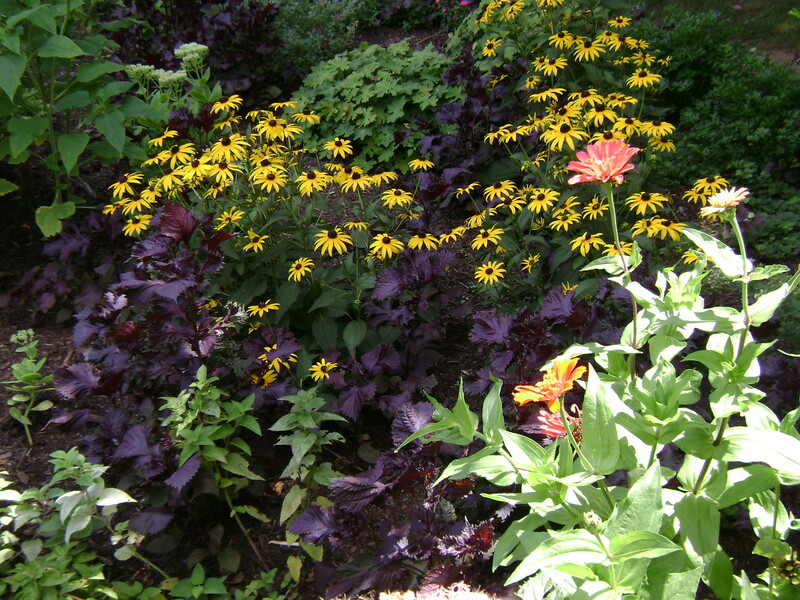 The site chosen for this garden is located in the Bloomfield half of Brookdale Park on the South side of the Field/Restroom House. A raised octagon bed with a square footed area of 309’. This bed is buffered from wind by its proximity to the Field House and mature oak/maple trees in front and sides. The plants selected are suited for sun to partial shade. A 150’ water hose connected to a faucet/sink within the House will be used to irrigate both gardens. 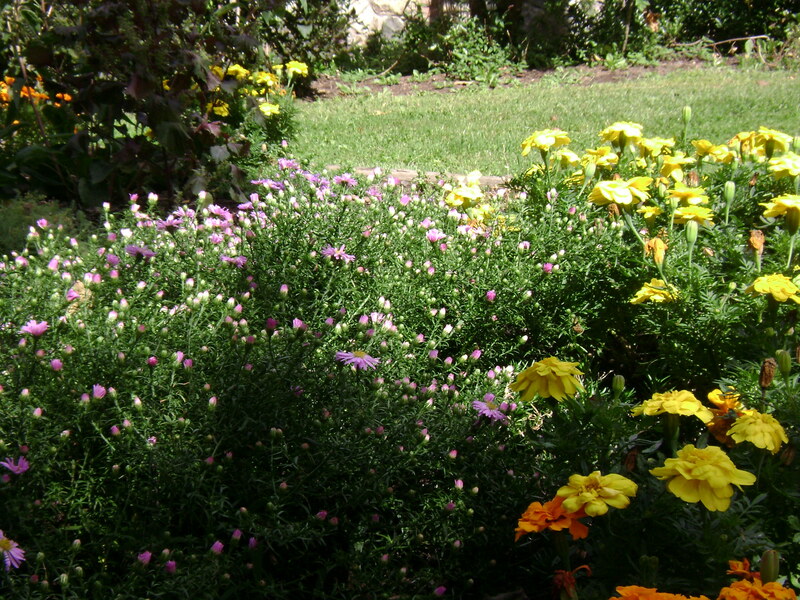 A combination of annuals and perennials were planted. Annuals planted = Dianthus, Snapdragon, Marigolds, Italian Flat leaf Parsley, Greek Oregano, Thyme, Zinnias and Mexican Sunflowers. Perennials = Lavender, Columbine, Hardy Aster, Butterfly Weed, Creeping Phlox, Yarrow, Shasta Daisy, Sedum, Purple Coneflower, Joe-Pye Weed, Spicebush, Montauk Daisy, Tall Meadow Rue and White Turtlehead. This second site for nectar and host plants is located southwest of the octagon where a pond once existed. It is presently evolving into a meadow which is in full sun. Water collects here when it rains and snows, in addition there is a cracked underground pipe which feeds the plants. There is a gradual slope leading to the meadow. A 150’ long area where a number of young trees, shrubs and vines growing adjacent to medium size rocks buried partially in the ground has been cleared. 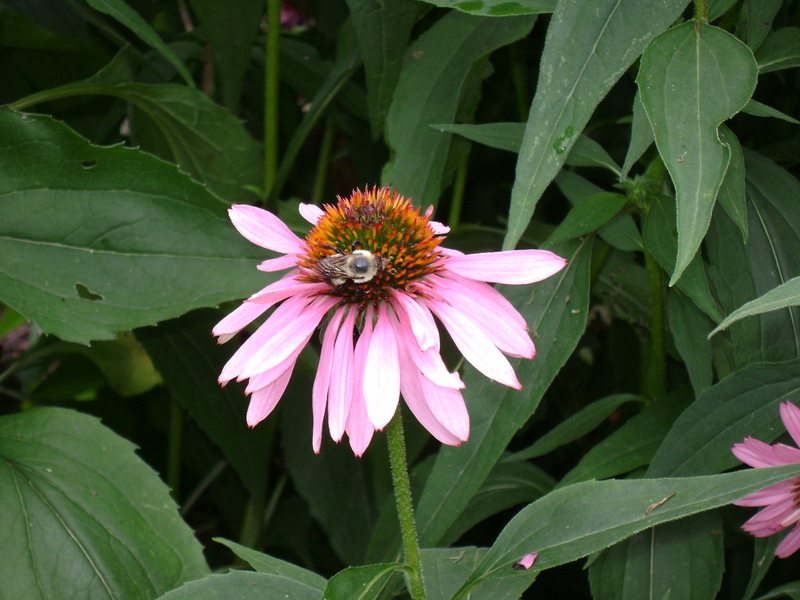 It is here that sun loving nectar and host flowers were planted. The rock area will be an excellent site for mud-puddling butterflies to obtain moisture and essential nutrients and minerals. They are also used by butterflies to bask and perch as they collect dew to sip and look for mates on a secure surface and absorb needed warmth for flight. Host plants will be visited by females to lay their eggs on selected leaves. Shrubs and Perennials = Lilac, Mock Orange, Silky Dogwood, Buttonbush, Nine Bark, Cranberry Viburnum, Wigela and Wild Geraniums. pesticides to provide valuable habit for butterflies, bees, hummingbirds and other pollinators. In the Spring of 2013 these 2 sites are in its first year. We were rewarded with a number of bees and Blue Swallowtail butterflies, visiting the bountiful array of flowers in the octagon. 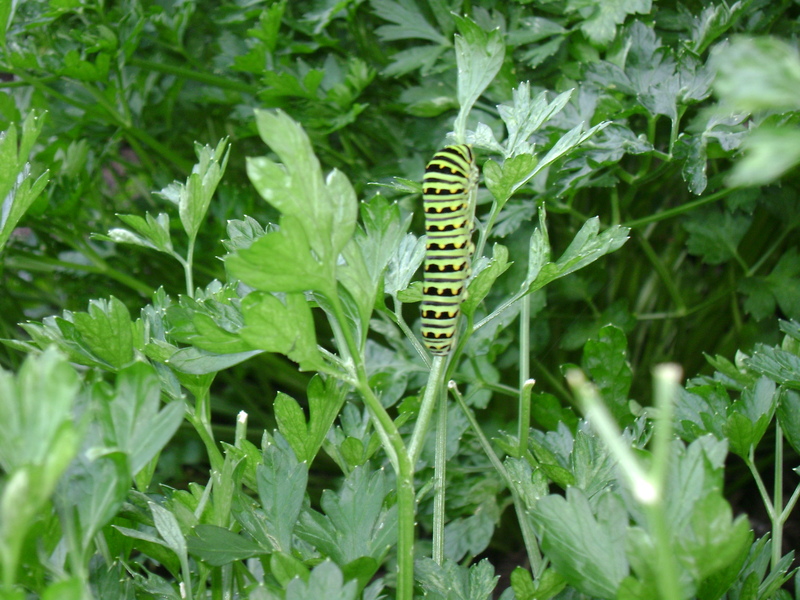 Within the Flat Leaf Parsley leaves, we were privileged to view various stages of munching Blue Swallowtail caterpillars. Site 2 has yet to prove itself as the shrubs needed more time to acclimate to their new environment. Yet we are hopeful. It is our hope you will visit our work!